Within the cutthroat realm of the Premier League, money reigns supreme, and survival can hinge on a single stretch of results. There’s a pantheon of elite teams, four of which can obtain that coveted Champions League football each season, all of whom feel they are a “right” season away from challenging for a title. Below them, a plethora of hopefuls, desperate for any chance to break into that eminent VIP club. Then there are the survivalists, those who know that their existence in the world’s richest football competition can be dependent on the smallest swivel of fortunes. Even those above them, consolidated in “mid-table,” know that they have to constantly adapt to ensure they don’t slip into a desperate race for survival. Looking at it, one could easily ask a simple question. How does a nineteen-year-old possibly hope to prosper in such a ferociously competitive environment? An environment where people are told to seize their chance when it comes to them, despite the fact that young players need nurturing, not ultimatums. Jadon Sancho became the youngest ever Englishman to score in the Bundesliga during Borussia Dortmund’s 4-0 win over Bayer Leverkusen in April. This past weekend, he scored his fourth goal of the season, pitching in a brace for Germany’s current table toppers. Those two goals sit beside an incredible six assists: meaning he’s registered ten goal contributions despite having played just 376 minutes in the Bundesliga. A few hundred kilometres away in Hoffenheim, Sancho’s “best mate” is finally adjusting to Bundesliga football after taking a while to be phased in to first-team action. In just 253 minutes of Bundesliga football, 18-year old Reiss Nelson has registered 4 goals and 1 assist. But that’s not all: he’s started the past two league matches, and he’s gained valuable Champions League experience under one of the most exciting tacticians in world football. So what would Marcus Rashford be thinking, looking at the rise of someone like Christian Pulisic? How would someone like Ruben-Loftus Cheek react to Kai Havertz making his first appearance for the German National Team at age 19, having become a mainstay at Leverkusen? And Phil Foden? His mate is currently one of the principal reasons that Borussia Dortmund sit atop the Bundesliga. Would he not be considering whether he made the right choice to stay at Manchester City? Foden, alongside equally gifted teenage prospect Callum Hudson-Odoi, has just 18 months left until his contract expires. Will he be swayed by the mouth-watering allure of Premier League wages, or, if his first-team opportunities continue to be limited, will he instead spurn a greater financial payout in order to get increased playing time and experience at a German club? In the years previous, English youngsters have been resigned to making off-the-bench cameos or filling their fledgling careers with minutes in England’s second tier. Now, they have a destination, a place where they can make good on their potential, where they can turn people’s heads. The Premier League’s brightest young talents are finding refuge in the Bundesliga. Sancho and Nelson aren’t the only ones, either. Marko Grujić, who couldn’t seem to make an impression for Liverpool having been there for two seasons, was a key feature in Hertha Berlin’s midfield until he sustained a ruptured ankle. Ademola Lookman escaped purgatory at a flailing Everton in order to find prosperity at Leipzig last season, where he scored five and assisted three in eleven appearances. Borussia Mönchengladbach, seeing the potential in prising away young talents from England’s “big six,” pushed heavily to sign Rhian Brewster, who scored 20 times in 22 appearances for England’s Under-17’s. Serge Gnabry, who couldn’t find an opportunity to progress at Arsenal, went to Hoffenheim, and was so impressive that Bayern snapped him up. In less than three years, Gnabry has gone from being frozen out of Tony Pulis’ West Bromwich Albion, to starting matches for Germany and Bayern Munich. There are good reasons for their prosperity too: Germany’s top flight is a testing ground for young players all over the world, not to mention the renowned factory of youth players in Germany as a nation. The style is much more open, the defending is nowhere near as resolute, and the pressure isn’t so suffocating that one bad game can hinder a player’s development as it so often happens in the ruthless coliseum of the Premier League. Look at other supreme young talents: the likes of Joshua Kimmich (who had 50 Bundesliga appearances for Bayern by age 20), Evan Ndicka (who has become a staple of Frankfurt’s first team this season at age 19) and Leon Bailey (who was signed for £10 million at age 19 and has since flourished in Leverkusen’s first team). Then there are the likes of Denis Zakaria, Santiago Ascacibar, Amine Harit and Dayot Upamecano: young talents are given the chance to coruscate, with the acceptance that they won’t shine one hundred percent of the time. Jadon Sancho clearly saw that, and Premier League clubs are following suit. 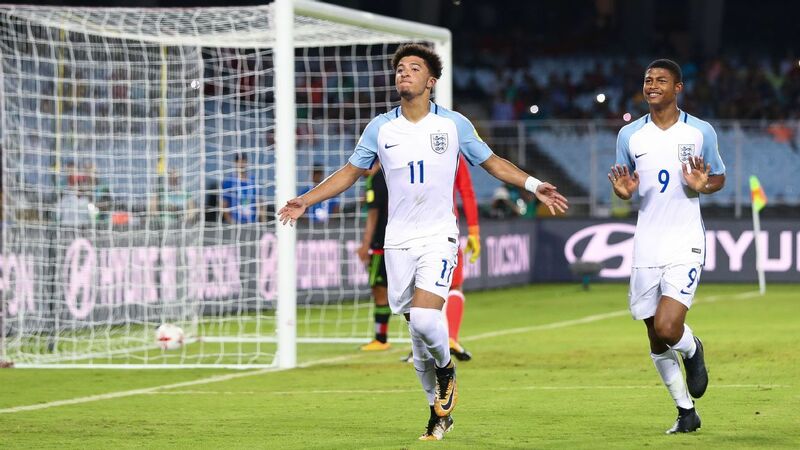 Much is being made of England’s resurgence under Gareth Southgate: founded on the roots of a wealth of young talent; a “golden generation” (though that term is becoming ever-despised in football) who are turning the tide on England’s prospects. The laureation of England’s youth is deserved, too: in the last two years they’ve won the Under-17 World Cup, U-19 European Champions and made the semi-finals of both the World Cup and Under-21 European Championships. And yet, only three of the players who went to the U-17 World Cup in 2011 have since been capped by the senior national team (Raheem Sterling, Jordan Pickford and Nathan Redmond). In the five years between 2012 and their World Cup triumph in 2017, only 1.1% of total Premier League minutes were played by English teenagers. The Under 21 side that recently beat Scotland 2-1, with names such as Nelson, Lookman and Tammy Abraham, has made a sum total of 207 top division appearances, most of which were in the Premier League for their various clubs. 52% of those appearances were starting berths (107 starts). The German’s U-21 side that recently beat Republic of Ireland 6-0, in comparison, has made a sum total of 465 top division appearances, nearly all of which have come in the Bundesliga. In contrast, 66% of those appearances were starts (305). The Premier League is simply too ruthless to give these players a chance. That’s not to say big clubs don’t bring through their own talent: Dele Alli has made 111 Premier League appearances alone for Spurs, while the defensive duo of Trent Alexander-Arnold and Joe Gomez have made 70 appearances for Liverpool between them. There’s also the likes of James Maddison, Declan Rice, Scott McTominay and Ryan Sessegnon, all impressing for their respective club sides in the Premier League. And when Mason Mount returns from his much-lauded spell at Derby, will he get his chance? Or will he suddenly be faced with the impossibility of trying to break into Chelsea’s starting eleven? Will he hit the Premier League wall? Ademola Lookman remains stranded on Everton’s bench, cast aside and a long way away from where he wanted to be in Leipzig. Dominic Solanke is marooned in the shadows at Anfield, Ruben-Loftus Cheek has dramatically faded into obscurity after impressing at Crystal Palace (although his four goals over the past two games may see his luck change soon) and Phil Foden has made just the single solitary start for Manchester City in the League Cup while amassing a grand total of 47 Premier League minutes this season. All while their mate makes headlines in Dortmund.